Models and schematic diagrams are powerful tools for studying the fundamental workings of chemistry, but they're not enough for Wilson Ho. "Atoms, molecules and the bonds that hold them together – I want to see these things as they actually appear in nature," says Ho, UCI's Donald Bren Professor of Physics & Astronomy and Chemistry. "These phenomena are central to chemistry; it's important to image them directly instead of just studying them from drawings in textbooks." Ho, who came to UCI in 2000, has made a career out of trying to understand intermolecular behavior. He wants to know "what the nature of this interaction is, what's really happening at the point of bonding and what makes molecules attract each other to form more complicated, extended structures?" In recent months, he and his research group have made significant breakthroughs in their efforts to see these heretofore invisible processes. Their goal was to get a snapshot of chemical bonds involving fluorine, which shares a column on the periodic table with other so-called halogen elements, including chlorine, bromine and iodine. Fluorine is used in a lot of drugs and in polymers that make up many of the materials people use daily. But, according to Ho, even manufacturers who handle molecules containing the element aren't clear on how it interacts with adjacent compounds. Using a one-of-a-kind, handmade microscope, Ho and his graduate students succeeded in imaging halogen bonds in real space and reported their findings in Science this summer. "Views previously attained through our method have shown that many chemical bonds are quite similar in the real world to what you see in the literature: basically, atoms with lines connecting them," Ho says. "But the pattern of the fluorine-halogen bond – a sort of pinwheel shape – was quite surprising, certainly different from anything you would draw on a sheet of paper." The veteran scientist says that this line of research has spurred an evolution in his thinking about chemical bonds, which are classified under such headings as hydrogen, covalent, ionic and halogen, as well as weak bonds known as Van der Waals interactions that Ho compares to the sticky footsteps of a gecko. "The deeper implication of our work is that all these different types of chemical bonds can be described within a more unified picture," he says. "Using our apparatus and technique, we can see that strong covalent bonds and weaker halogen bonds appear very similar; there's just a difference in strength and the degree of electron sharing." Key to all the discoveries coming from Ho's lab is an instrument called a scanning tunneling microscope. Occupying three levels in the basement of Reines Hall, the hulking conglomeration of stainless steel chambers and pipes – much of it covered in crinkled foil – is connected by miles of wires and cables and surrounded by banks of computers and other electronic equipment. Designed and built by Ho and graduate students, the apparatus hovers on a set of four shock-absorbing stanchions to minimize any disturbance from external vibrations. This microscope doesn't use an optical lens. Instead, it images molecules with an electron-emitting tip, or needle, positioned just 5 angstroms from subjects. (In comparison, a hydrogen atom is half an angstrom.) The needle is stable to one-thousandth of an angstrom. Another key to the instrument's stability and precision is its operating temperature, 600 millikelvins. Absolute zero, the lowest theoretical temperature, is colder by just six-tenths of a kelvin. "This gives us very good energy resolution, which allows us to precisely measure minute electrostatic ripples inside and between the molecules we're studying," Ho says. "We can obtain images by monitoring variations in the vibrational intensity of our probe molecule." 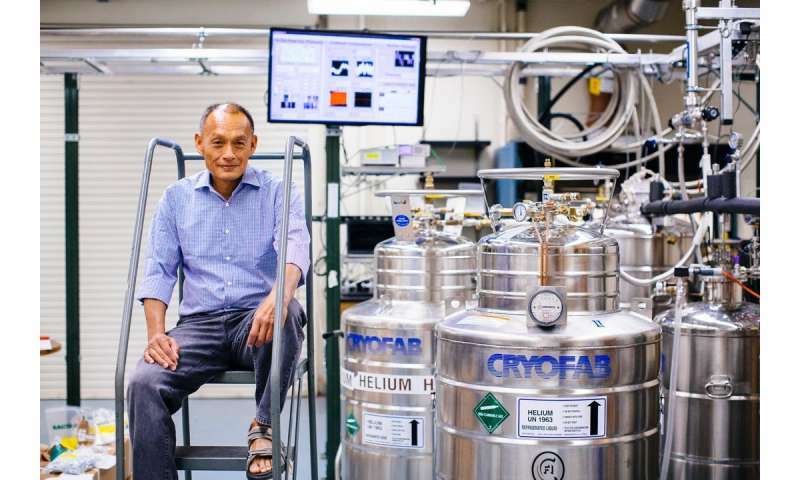 To get down to that temperature, he taps into his own supply of liquid helium, which he recycles in another Reines Hall facility, also designed and constructed by his team. "We like to build our own instruments," Ho says. "It provides good training for the students. When they leave here, they can rely on all of that experience in solving problems and making devices. Not many places do that." One such graduate student, Gregory Czap, has put his mark on the microscope by inventing interlocking devices that let researchers rapidly switch experiments. "I think it's pretty phenomenal to get to work on a machine like this," he says. "It gives you the ability to look at single atoms and bonds. Things like that, not very long ago, people didn't think you'd ever be able to actually see. And more than looking at them, you can play with them. You can do things like break and form bonds. You can reposition molecules to see how they interact with one another. It's just amazing."